Science as a destiny: Let's play - Name that Flower! Let's play - Name that Flower! ...so when the Animal and Plant Science Department hosted a 'Plant Identification Day', I was quick to jump aboard! 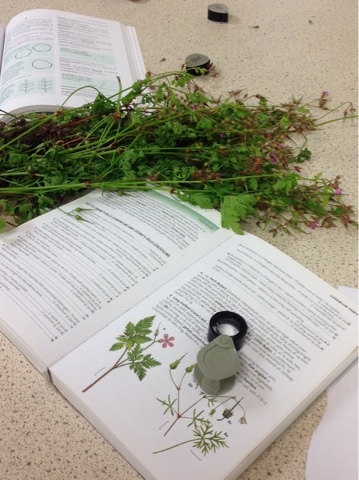 Working in the teaching laboratories, our host - wildflower enthusiast Emma Jardine - started by giving us a basic introduction to the main flowering plant families. It was daunting at first to hear that there are over 2,500 plant species native to the UK, grouped within 140 families. However, it turns out that 80% of UK species can be grouped into just 20 key families. Emma kindly made things easier still by focusing the session on just ten of these. She had been busy that morning, scouring the local hedgerows and had brought along representatives of these ten families... But she wasn't going to tell us which was which! Armed with copies of Francis Rose's 'The Wild Flower Key: How to Identify Wild Flowers, Trees and Shrubs in Britain and Ireland', we paired up and got to work. Although wildflower keys can be excruciatingly complex, being able to group the plant into a family straightaway saves a great deal of work. Fortunately, there are some simple rules that make this easier. Are the flowers bilaterally symmetric? ( that is, if you cut it in half from top to bottom, the two halves form a mirror image). Then it probably belongs to Lamiaceae or Fabaceae. Do the fruiting bodies have a long beak-like extension, similar to the bill of a crane? Then you may have a member of Geraniaceae. But identifying the family is only the beginning. The fun really starts when delving into the complicated keys to pinpoint the exact species. The details can be very exacting - are the leaves 'smooth', 'hairy' or 'more or less hairless'? Is the flower pedicel less than 5 mm? What colour are the stamens? Where did I put that eye lens??! Got there in the end! We finally managed to key out Geranium columbinum, otherwise known as Long-Stalked Crane's Bill. I was soon enjoying myself, especially as the key drew my attention to many exquisite features which I had never considered before - each one serving to distinguish each unique species. Sadly, my afternoon experimental plans prevented me from joining the others on an excursion to a local nature reserve, but I could already feel the tangible benefits from the session as I walked home that evening. Instead of merely thinking 'What a pretty flower! ', I found my thoughts running more along the lines of 'Palmate leaves and a terminal inflorescence with an actionomorohic shape...surely a member of Ranunculaceae?